This is a fluid document, please check back as changes/updates may be made. What will our legacy be for future generations of LPS families and students in 15, 25, 50 years? Fifty years ago this community left a legacy that we are still living. But what do we need to do now to ensure that our students are prepared for the future? As one of Colorado’s highest achieving school districts, Littleton Public Schools has long provided students with an outstanding education. And as the job-scape continues to change with technology pushing us forward, LPS is committed to ensuring that we are prepared to educate our students for tomorrow’s world - in an environment where our kids are engaged and passionate about what they are learning. Our students deserve the best. Our community expects the best. And LPS is prepared to deliver. As part of our larger plan to ensure that LPS continues to offer the best possible education, the district adopted a new academic achievement goal in 2017. The new District Achievement Goal states: 100% of LPS students will graduate prepared for meaningful post-secondary opportunities. It is our objective to ensure that all LPS students leave our classrooms and enter the world as well-adjusted young adults, equipped with the tools they need to be successful in a 21st-century workplace. Additionally, the LPS Board of Education outlined priority goals to help lead the district down this important road of planning for the future. Priority Board Goals include: planning for the effective use of resources; refining and expanding academically rigorous pathways; growing and improving safety, security and mental health processes and procedures; and providing effective professional development to ensure quality education and to recruit, retain and grow exceptional leaders, administrators, and staff. The time, opportunity and expectation to create. The energy to explore passions and the unknown. A supportive culture where risk-taking is encouraged and relationships are cultivated. Permission to learn and demonstrate learning in different ways. LPS is committed to offering additional relevant college/career pathways and preparing students for the changing expectations and rigor of college, as well as for the rapidly changing workforce. In the fall of 2017 Dr. Bill Daggett - education leader, visionary, and provocateur - spent time with LPS leaders, staff and community members to help begin the process of imagining what the future in LPS could look like. He began the process by helping LPS to consider some introspective questions to help ensure that the vision is relevant and personally suited for this district. For our students. For our community. What does education need to look like in order for our kindergartners to be successful in 2030? What skills will the future workforce demand? How does a high-performing destination district such as LPS remain relevant, innovative and visionary? Additionally, the Board of Education charged the Long-Range Planning Committee with reviewing the district physical plant, program capacity and major capital equipment requirements and determining what improvements to efficiency and sustainability and infrastructure needs may be required during the next five to ten years. How can we facilitate learning experiences that allow students to engage in 21st-century skills? How can we engage non-traditional learners? How can we maximize the learning of students who already do well in a traditional school setting? LPS is very good at serving traditional learners. We need to find ways to better support the growing number of non-traditional learners as well, particularly in a landscape that increasingly demands a different skill set. Through research and conversation with our business partners, we can see a shift occurring. The top skills in demand for a job in 2015 are already quite different than those projected to be the top skills needed even just in 2020. If passed, a statewide initiative would provide the ongoing money needed to support school districts in Colorado. There is simply no way to solve this funding crisis without a statewide ballot initiative. Under TABOR, the law requires that any tax increase must be approved by voters. Language for a statewide initiative is currently being written to be included on the November 2018 ballot. 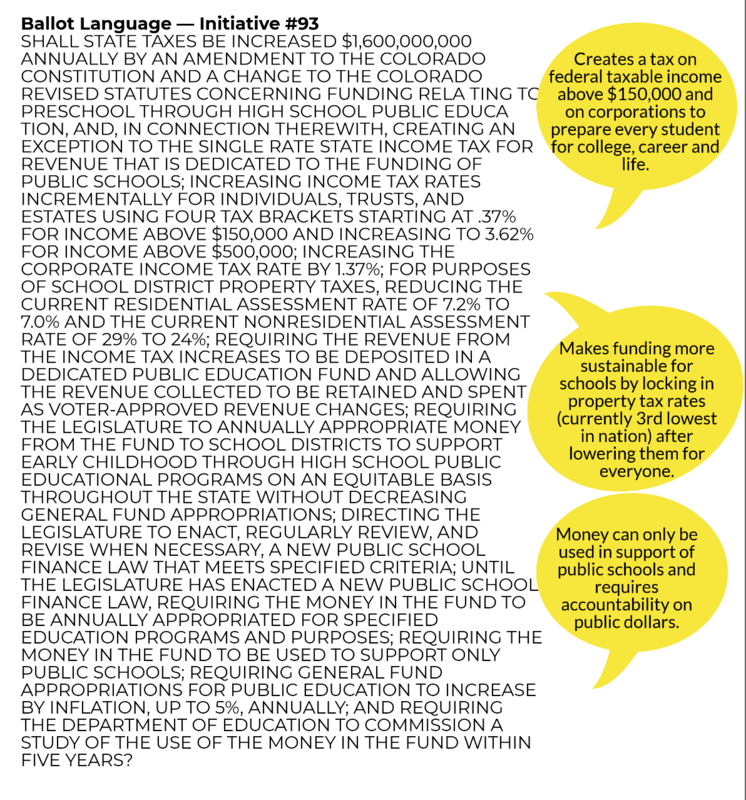 If passed, the Superintendent’s New School Finance Formula (HB 18-1232) would ensure that dollars collected from the passage of a statewide initiative would be distributed appropriately to better meet the needs of our schools and our communities - moving the state towards adequacy and equity for K-12 funding. Colorado superintendents came together to support HB 18-1232 as a response to the challenges created by the current school finance model. Based on student needs, the new formula would better serve all students, particularly those who are currently underserved and those who face the greatest challenges finishing high school prepared for college or a career. As a result, LPS would secure an additional $20.2 million annually. The Negative Factor has shortchanged LPS of $101 million in the last eight years. Programming is not keeping up with what college and the workforce demands and expects of our graduates. Aging facilities are beginning to fail and in some instance are no longer recoverable. Others never met ADA requirements. This lack of funding has serious implications, causing things like teacher salaries, special education, mental health services and school facilities to suffer greatly. For example, Colorado teacher salaries are well below the national average, leading to higher student-to-teacher ratios and overcrowding of classrooms. Colorado currently ranks 42nd in the nation in per pupil funding and 50th in the nation in teacher salary competitiveness. Colorado funding is way below the national average. Creates a tax on federal income above $150,000 and on corporations to prepare every student for college, career and life. Makes funding more sustainable for schools by locking in property tax rates (currently 3rd lowest in nation) after lowering them for everyone. Money can only be used in support of public schools and requires accountability on public dollars. Staff, parent and community feedback gathered through presentations and surveys. Long Range Planning Committee continues to study the issues and makes recommendations to the Board of Education. Board of Education decides whether or not to put a ballot question before LPS voters. Signatures gathered across the state and verified in order to place Initiative 93 on the statewide ballot. Possible statewide election for Initiative 93. Possible local election for a bond to support LPS. If you can write an algorithm for a task; the job is gone. The workforce is rapidly changing and we need to be able to prepare our students for tomorrow’s world. But Wait, What Happened to All the Marijuana Money? When Colorado legalized recreational marijuana, there was a lot of talk of that money helping schools. But it is a misperception that most of the marijuana tax revenue goes to K-12 education. The majority of funds go to the Marijuana Tax Cash Fund for healthcare, health education, substance abuse and treatment programs and law enforcement. Through a CDE Health Professional Grant, LPS gets enough money to fund two positions – grant funds are limited to three years. 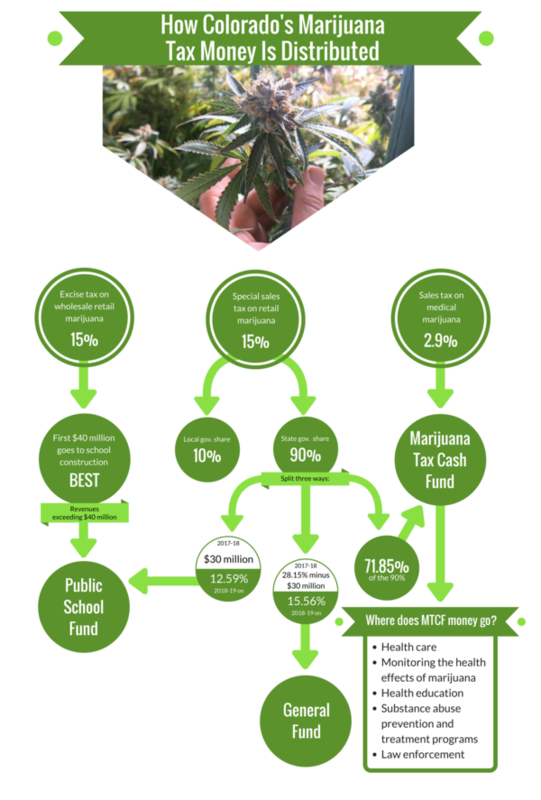 From the 15% excise tax on marijuana purchases, money also goes into the BEST fund. In 2017-18 this fund made available only about $40 million for school construction – and districts are often required to provide matching funds. Additionally, about $30 million will go to rural schools. The reality is that marijuana tax money is benefitting school districts – and that is a good thing. 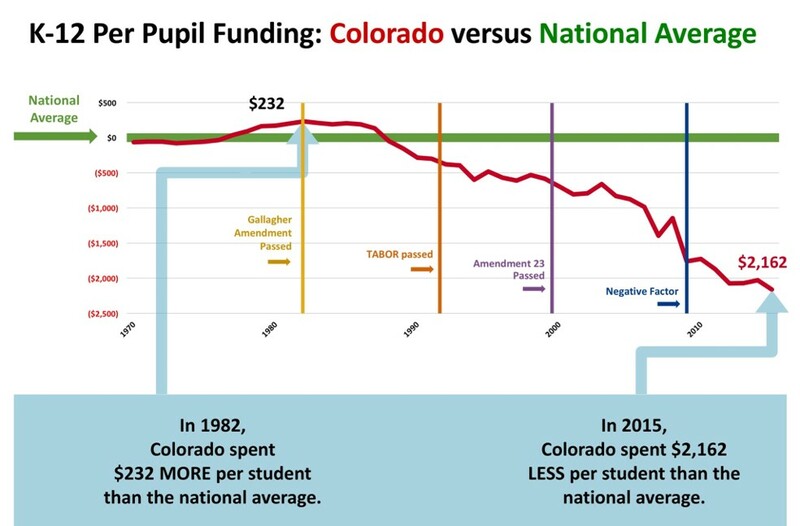 But it is not nearly enough to fix the fact that Colorado schools are underfunded by about $830 million.